This is the area where my creativity has been most active over the last decade. It is also the area that is most autobiographical. I came to poetry late in life, so I had a lot of memory to explore and manipulate with great excitement discovered in the reading of it - and eventual memorization and performance of the poems, as well, in recent times. I'm told these poems are surprisingly honest and sometimes funny, as well. 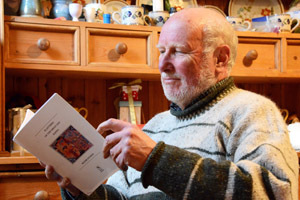 My three collections to date contain many poems, long and short, based on incidents in my fairly eventful and varied life, not to mention the changing society I've lived through. Each collection is more or less in chronological order, but that still leaves quite a bit of jigsaw-puzzling for the reader. 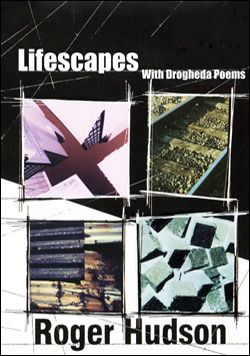 My first collection Lifescapes was half of the two-hander Side-angles (2005) that I did with Steve Downes. As a solo collection, Lifescapes is now available for download on Kindle. 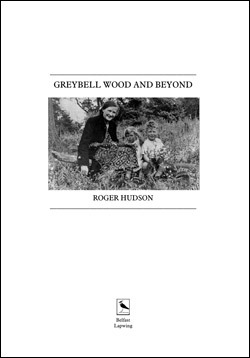 Greybell Wood and Beyond (2010) and Plaything of the Great God Kafka (2013) were published by Lapwing Publications in Belfast. Together these three collections reveal my erratic life and attitudes to it. Hopefully more will join them in print soon. 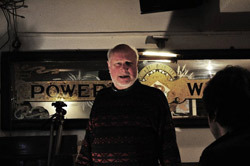 Karl Parkinson, performance poet, at Dublin launch of Plaything of the Great God Kafka at Monday Echo, International Bar, May 2013. Roger’s poems capture treasured moments, and, when he reads them aloud, he gracefully unfolds them for us – this is a blessing. It's been really exciting for me over recent years getting into performing rather than simply reading my poetry. 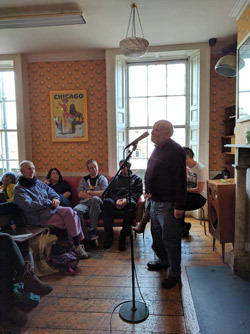 It all started with discovering the new events in Dublin that presented poets and singer-songwriters in an informal cabaret format. After I participated in a few sessions, I graduated from the Seven Towers open mic (now Sunflower Sessions) to the Glor Sessions, Tongue Box, 50 cent Theatre, Monday Echo, etc., etc. Realizing that younger poets like Stephen James Smith and Karl Parkinson were getting so much more out of their poetry and reaching the audience more deeply by performing from memory, I decided to try it myself. I discovered that I actually could memorize quite long poems. Something really great about playing to an audience and being able to gesture and make eye contact. 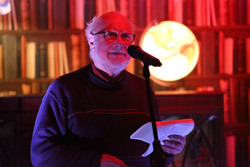 This all brought constant surprises at discovering new things in my own poems and the thrill of being part of a revival if not a revolution in Irish poetry, which has led to major showcases like the LINGO Spoken Word Festival, regrettably no longer with us. 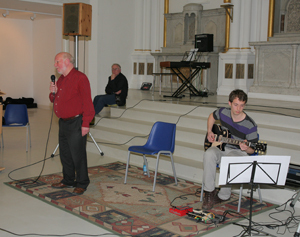 Other adventures in poetry include the four lunchtime Experiments in Mood and Meaning at Highlanes Gallery in Drogheda in 2012, which got me into performing with the magical improvised music of Claire Fitch and her electronic cello. We went on to perform as Hudson 'n' Fitch in other venues. Also, with Nuala Leonard, Brian Quinn and Anne Tannam, we lightly dramatized our poems. Together we performed elsewhere as Word Jungle. 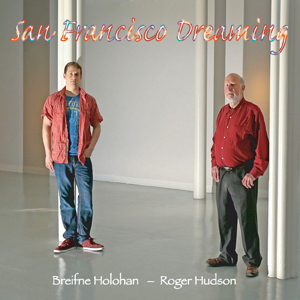 A CD titled San Francisco Dreaming of 5 poems from my collections was produced in 2016 with Breifne Holohan, well-known Drogheda musician. That was a weird and wonderful experience recording those tracks in the ethereal acoustic of Highlanes Gallery. You can listen or download here. 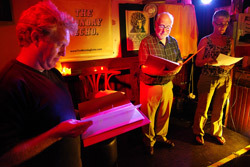 Biggest venture so far was The Great Drogheda Poetry Show in November 2012. This was a fully staged evening in the theatre at Droichead Arts Centre in Drogheda with 13 living and 5 dead bards and poets, three musicians, a presenter, stage lighting, projections, sound effects - the works! All of this was to celebrate the 600th anniversary of the merging into one of the two rival towns of Drogheda on each side of the river Boyne. John F. Deane, Anne Le Marquand Hartigan and S.J. McArdle were featured. 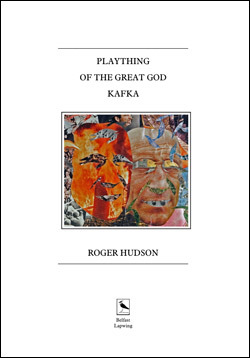 Click here for a collecton of readings by Roger at home.